Many years ago I convinced someone I knew to buy Loveless, and their first reaction on playing it was to tell me they thought they had a ‘warped’ copy. I replied that they almost certainly didn’t, and that it sounding warped was kind of the point. I’ve owned Loveless for the best part of 20 years now; I think I bought it in early 1996 when I was 16 and going through a very serious period of musical exploration. A lauded ‘classic’ even then, Loveless already carried a near mythical aura with it when it was barely 4 years old. I had no idea what to expect. Over the years since people have written reams and reams of verbiage about Loveless – it’s one of the few records I own a book about – and I still don’t know that anything anyone’s said would quite prepare you for what it sounds like on first listen. Tom played Isn’t Anything for us at record club a few years ago, and I said back then that “it has a physicality, a bass, a drive, which I think, on some days, makes me feel it’s a better record than Loveless, which can feel one dimensional and rhythmically staid at times. Isn’t Anything is no less rhythmically staid, but that physical dimension adds an enticing brutality.” I still agree with that, but facts can’t be ignored: I reach for Loveless a lot, far more than Isn’t Anything. That one-dimensionality is actually one of Loveless’ strengths a lot of the time though; it may not cover the same degree of sonic terrain as Isn’t Anything, but the valley it does explore is exquisite. The way the segues between tracks help it coalesce; the way it has radically different effects depending on how you listen to it (a soothing balm when played quietly, a baffling, chaotic miasma when played loud); the way moving the position of your head makes those guitars phase in and out of sync with each other even more than they already do; the way the very simple, almost laughably linear song structures make you lose your place in the chronology of the album; even the way the lyrics, which Shields and Butcher apparently spent even more time perfecting than the music, can’t actually be discerned 90% of the time because they’re buried and overwhelmed in the mix: it all adds up to a blissful, intensely-textured, swooning sameyness. I know “Soon” first and foremost as the closing track here rather than as the (indie disco) hit single it was 18 months or more before Loveless was released, so to me it doesn’t sound tacked-on (which is often suggested); it sounds like a tantalising signpost towards a future that took another 22 years to arrive. Brian Eno described “Soon” as “the vaguest music to ever be a hit”, and that’s a great word to apply to the album as a whole; ‘vague’. It sounds almost exactly as the cover looks. Wonderfully vague. I’ve never got tired of it. Rob listened: I’ve never got into it. 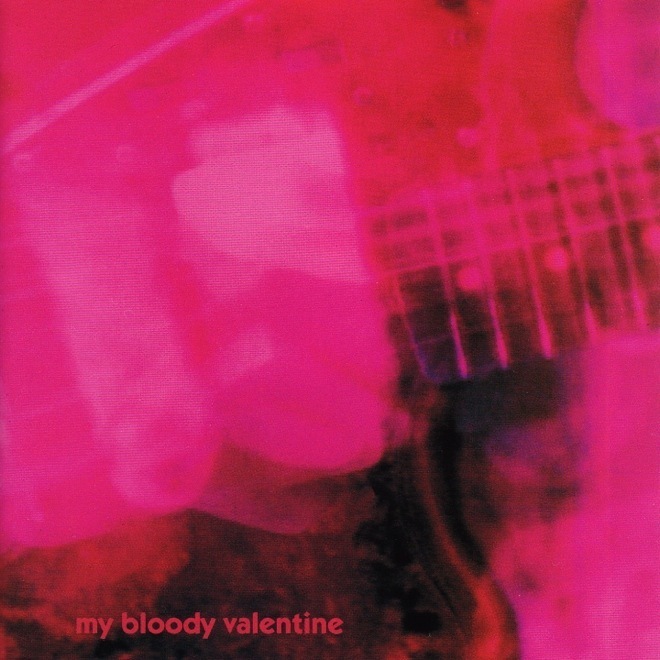 I like My Bloody Valentine, and I like ‘Loveless’ some of the time, but I’d be lying if I said that I feel anything much more for it. It’s like a kid you knew at school who you always thought would be good to be friends with, but try as you might you only ever had fleeting, inconsequential conversations with. Years later, you find out he was killed in a fire at an ice rink and you realise you’re not all that bothered that he’s not around anymore. Maybe you miss the ice rink more, now you come to think of it. I’ve tried, and over time I’ve heard all the things Nick talks about here, particularly that deftly disguised simplicity, swathed in blankets and fog, but unmistakeable. I hear them all, but those things just don’t add up to all that much for me. I really enjoyed listening to it again this evening. It sounded great through Nick’s fancy gear and he’s right that the volume adds texture and nuance, but the main thing for me was that I couldn’t leave. Because try as I might, over the years I’ve found ‘Loveless’ such an easy record to leave. If it’s the record Nick has listened to most over the last 20 years, then it must be the record I’ve wandered off in the middle of listening most during the same period. I like plenty of foggy records, and I love plenty of records that have never ‘clicked’ for me, their foreign mystery is part of the attraction. I guess I should be bold enough to admit that whilst I love ‘You Made Me Realise’ and ‘Feed Me With Your Kiss’ and I really like a bunch of other MBV tracks, I think that might be it. If I was bolder I’d stand here and tell you I think ‘Loveless’ is over-rated. But I’m not and anyway, who the hell am I to tell you that? I’m only bold enough to tell you that I don’t love it. Tom listened: Nick has always attested that Loveless is,ostensibly, two different records: when played quietly it has the capacity to soothe and caress yet when the volume is turned up, it can pummel and disorientate and impress. I see what he means but I don’t think I quite get the record as he does – in its quieter state I find it too soporific and distant to be anything other than aural wallpaper. I like it much more when it’s loud but still have never quite clicked with it in the way I did with Isn’t Anything, no matter how high the volume level! At record club Nick played Loveless in its ‘barely there’ state, so I have listened to it again tonight, turned the dial up and waited to see what would happen. It sounded much better to me and I really enjoyed it, but I still can’t quite get rid of the annoying nagging feeling that something is missing…just not sure what exactly. The melodies are there for sure; they are, if anything, even sweeter than on Loveless’ predecessor. There are moments of bliss, moments of brutality, and plenty of weirdness. Guitars are amazing throughout, obviously. I think…and it feels strange to say this to a record that Nick has brought along…that my biggest single problem with Loveless is the production. No doubt it was a deliberate decision by Shields and Moulder (and Scully?) but, for me, the washed out waves of noise have the effect of producing an album that is a bit flat, and I miss the peaks and troughs, the light and shade of MBV’s output from the two or three years prior to Loveless. In the words of my daughter, who is unburdened by the weight of critical acclaim the album has received over the past 20 years, ‘I am indifferent to it – it sounds a bit like background music’…and this was whilst it pounded out of my speakers at ‘neighbour bothering’ volume! But I’ll keep returning to it every now and again and, who knows, maybe one day I’ll see the light.